Ohio Chinese Crested Rescue View other Chinese Cresteds for adoption. Lin is an approximately 10 year old mixed breed. Yes, she is hairless, but don't panic, she is supposed to be that way!! 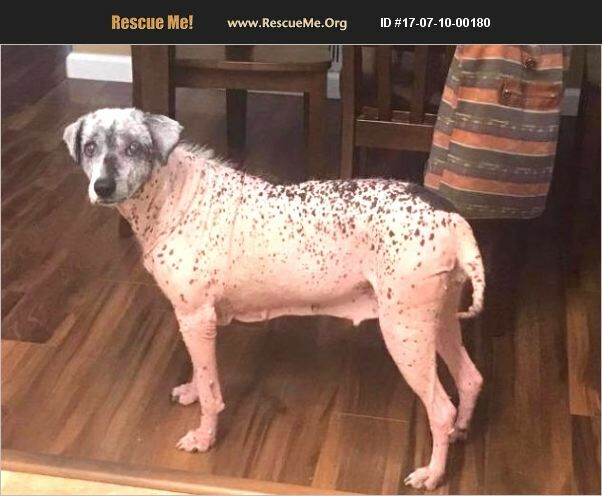 The vet believes she is at least part hairless breed, such as Chinese Crested or Xolo. Lin was found in a cemetery in Kentucky, dumped with another hairless dog, who we also rescued. She appears to have lived a HARD life, but she is still very sweet. She had many medical issues we had to work to overcome, such as a large tumor on her foot, dental work, unaltered, a variety of eye ailments, and worst of all, she was heartworm positive. Lin is now in tiptop shape and is completely ready for her new home. The only ongoing care she will need is eye drops for chronic dry eye....and lots of sunscreen. She would love to be the only dog in her new home, so she can be treated like the princess she is. She is house trained and crate trained. Lin has been spayed, vaccinated, microchipped, and treated for heartworm. Her adoption fee is $150 and you can fill out an application on our website at www.pawpatroldayton.com/adoptable-dogs.All of our animals are vaccinated, micro-chipped and spayed/neutered before being adopted. Our adoption process begins by filling out an application at our website http://pawpatroldayton.com/adoptable-dogs/. Your application will be reviewed. Then your vet and personal references will be contacted. Approved applicants will be contacted for a meet-n-greet in the order applications are received. Then there is a home visit and then the adoption. The amount of time the adoption process takes varies. We are an all volunteer rescue. Please understand we are all doing our rescue work outside of our jobs, families, and other commitments. It takes time to contact references, to schedule meet-n-greets, home checks & adoptions that work with your schedule, as well as, ours. Please be patient with us during this process. We always want to place our dogs in a good home as quickly as we can.